Caption slip reads: "Daily. Photographer: Swaim. Date: 1958-09-01. Reporter: Swaim. Assignment: Fish Canyon fire. 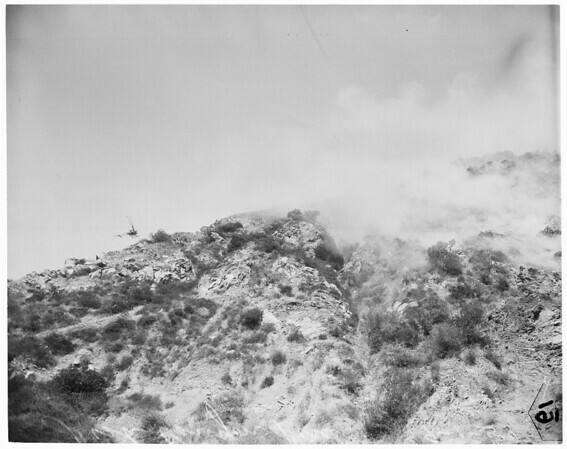 1-6, 13-14, 17-22, 25-28: General shots, Fish Canyon fire, some showing tanker planes dropping water loads, some of hurried rescue of two injured fire fighters. These were brought down sheer canyon wall by pants sliding rescuers just ahead of fire."